guest singer and speaker Sandra Sheskin Brotman. and change you through its powerful message. Spread it abroad to family and friends! Little could Hitler have imagined as he stood at the height of his glory with his Nazi leadership, preaching his message of hate in the Olympic Stadium, that 40 years later in the very same stadium, 30,000 Germans and attendees from 25 nations would be repenting to God and asking forgiveness of the Jewish people for the murder of over 6 million of Jesus' kinsmen according to the flesh, His Jewish People! Hear Merla Watson, world-renown composer and musician, sing "I Wonder How Long This is Going to Last?" written in response to an Israeli Holocaust survivor's questioning the true commitment to Israel of those Bible believers she watched as they marched in a Pro-Israel Parade in Jerusalem. Holocaust Survivor Rose Price shares her extraordinary story, "From Dachau with Hate to Berlin with Love and Forgiveness." She describes her 5 1/2 years of torture by the Nazis as a child and the extermination of her large Orthodox Jewish family. This event was a turning point in Rose's life and ministry worldwide. 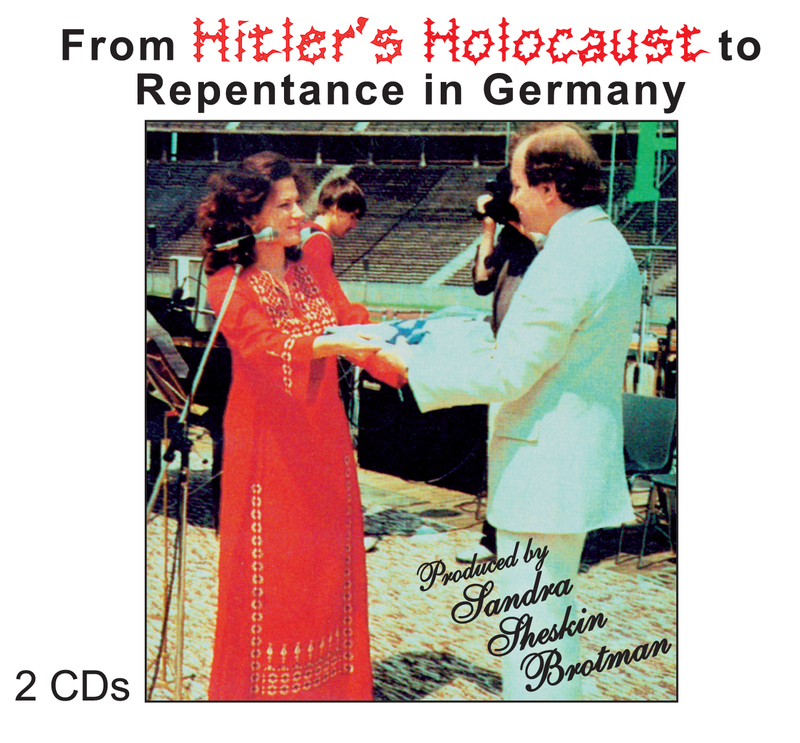 Sandra Sheskin Brotman, Messianic Jewish recording artist (whose family members were murdered in The Holocaust), surprised her German audience when she asked their forgiveness for the former attitude of her heart. Sandra's song of God's Eternal Love Covenant with Israel, His Wife (based on the book of Hosea), stirred her audience. Sandra's personal flag of Israel, which she displays wherever she ministers worldwide, was flown from the tallest flagpole in the Olympic Stadium during this service of reconciliation! Peter van Woerden (nephew of Corrie ten Boom), Sid Roth of Messianic Vision radio and It's Supernatural! TV program and Steve Lightle, author of Exodus II, also participated in this once-in-history life-changing event! The usual reaction from both believers and non-believers who hear these moving messages and music of reconciliation and forgiveness is "profound" and "awesome". They often are stirred to share this double CD with others.